Student-trustee member Colin Santee shows a crowd of Johnson State College students financial data on Vermont State Colleges Feb. 19. 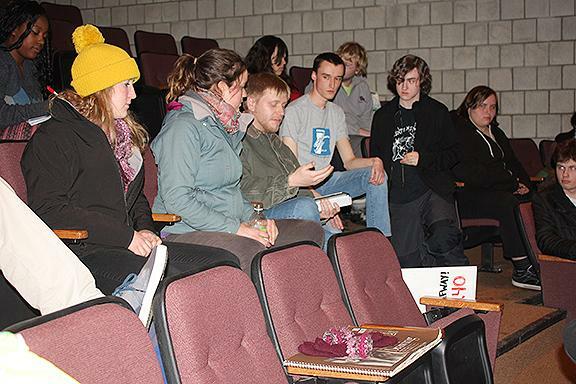 The Vermont State Colleges board of trustees met and voted Feb. 20, casting out a proposal to freeze tuition increases and instead approving a 3 percent tuition increase for 2014-2015 academic year. The night before, however, students gathered at a session led by Student Government Association President Nasser Abdel-Fatah and Colin Santee, the student representative on the VSC board of trustees, to discuss their feelings on the looming tuition increase proposal. Santee made it clear that he wanted to hear the students’ thoughts on the matter to take into consideration when voting on whether to approve the tuition freeze but that he was not representing the board by being there. He and Abdel-Fatah also made it clear that the tuition increase was to meet a gaping deficit all Vermont State Colleges are facing. “All of the schools, including CCV, would be in the deficit at a zero percent increase,” said Santee. “It doesn’t get until 3 percent where CCV and then Castleton, Lyndon are close –meeting their projected deficit – but there would still be little bit of a deficit. And that’s with a 3 percent increase.” Johnson, he said, would need a 4 percent increase. Abdel-Fatah said that if tuition were not raised, the college would have to make adjustments. “Cuts, in other words,” said a student from the crowd. Other discussions were sparked by the fact that as a state college, it is supposed to be “substantially funded” by the state, as declared in 16 V.S.A. 2171. Also brought up was the bill S. 40 that is being pushed to get Vermont Legislature to return to 1980’s funding levels, which amounted to 51 percent of VSC’s revenues. “I’d like to see the board of trustees and the chancellor focusing more on pressuring the state and getting students empowered enough to have a voice,” said JSC senior Liz Beatty-Owens, a politically active student. Increasing tuition or whittling away at programs at the college, she said, is the easy way out. Although none of the students said they were glad there may be an increase, some students said they were willing to make concessions. Ganguly-Kiefner said a 1 percent raise would be doable, and Beatty-Owens said she’d happily pay the 3 percent raise – if she knew for sure that the money would be going to ensure a livable wage for faculty and staff at JSC.